I hadn’t really planned to garden on Saturday — I have been fantasizing about a day of decadent rest with books and a lightly spiked drink — but after Jimmy and I dropped Lydia off at 6:30am in the South End for the first leg of her trip to Vietnam and Cambodia with Boston Children’s Chorus, I had a hankering for both dirt and improvement. “Sure,” said Jimmy, the driver. 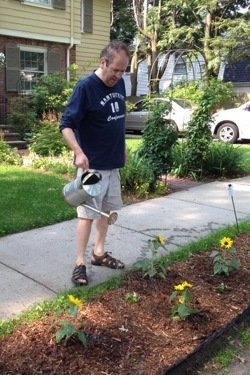 By 7:30am, we had pots of sunflowers, flats of ground ivy, and one red dahlia, which I had to buy because, as I told Jimmy, “It’s alone, and it needs me.” It was the last dahlia in sight. 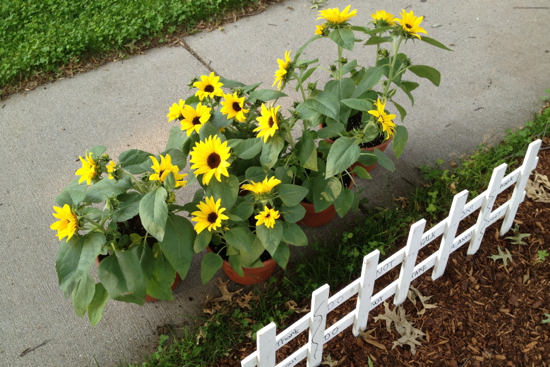 The sunflowers that Lydia and I planted a few weeks ago never really took off. I blame the black landscaper’s cloth; I should have used the white cloth I used for my first folly. 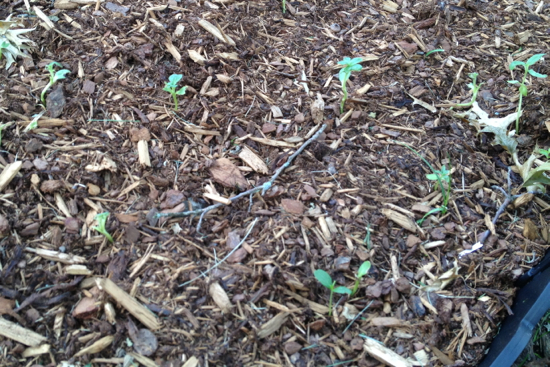 A few seedlings came up here and there but not enough to insure a burst of yellow in August. Instead of giving up and throwing down grass seed, I thought I’d help nature along and augment our few babies with some adolescent plants from the nursery. 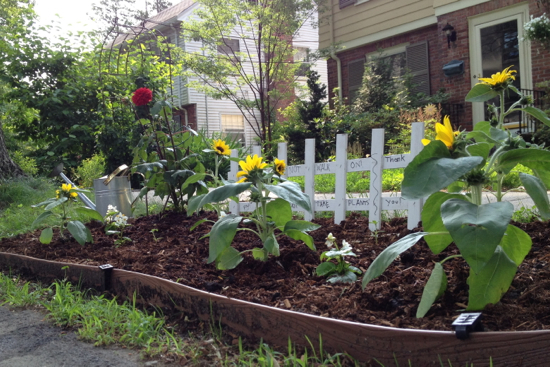 By 8:30am, they were planted in the two narrow rectangles in front of the house between the road and the town sidewalk. The dahlia doesn’t really fit, but she needs sun too, so I nestled her in with the sunflowers. After we had a coffee-and-dog break, Jimmy went back to Home Depot for some rolled sod, which was scheduled to arrive in the store at 11am. Meanwhile, I started digging up the area around my path to nowhere. The heavy rains mid-June had pounded away a lot of the grass seed, and the water also revealed some stones that had been too deeply set. They were enough below ground level that a huge puddle formed, about two inches deep and three feet in diameter. The birds were happy, but I didn’t make the path for it to become an occasional birdbath. 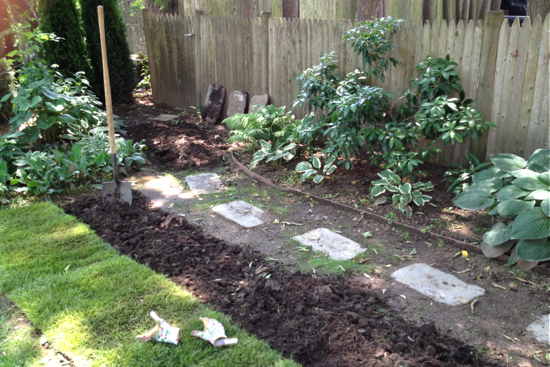 As I dug, I thought about writing and especially about revising. 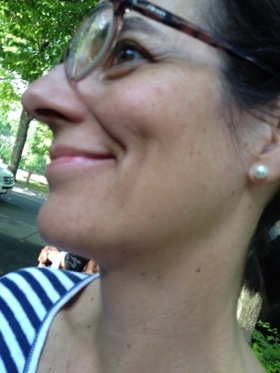 It can be very exciting when you jump into a new project full of energy and vision. 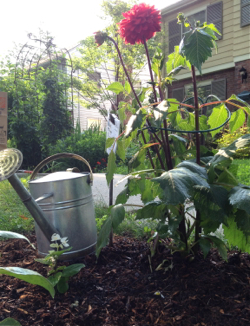 The satisfaction of finishing a first draft — whether it’s a poem or a new flower bed — reflects a glow onto the work itself. For a while, the draft can shimmer in beauty simply by virtue of being done and having an existence outside the maker’s head. But then some time passes, whether days or weeks, and shimmer fades and the reality of the draft reveals itself. There are awkward phrases; there are gaps; and there are puddles that make only birds happy. Jimmy returned with the sod, and he dug too. We got dirty, and the closer we got to getting done, the messier this revision became. I tossed rocks to the side as I came across them. We pulled up stray roots. I wondered of course why I was re-making a path to nowhere. The world doesn’t need it. In the middle of revision, even though I enjoy having something to work with and puzzling over problems, it often starts to look worse before I can make it better. In such moments, it is tempting to put the hard work aside and fall in love with a new project. People say the blank page is scary, and it can be, but it’s also full of possibility: a screen I can project my hopes onto. In the middle of a revision, it’s easy to lose heart, because I can start to see what my poem or essay or sunflower folly or wandering path will not become. And yet only by finishing it will it become something. So we dig, shovel, smooth. We finish, as well as we can.